The powering of the LHC superconducting magnets will be made via 3250 current leads transporting in total about 3 MA of current into the “cold-mass” of the LHC machine. They will be installed in the LHC tunnel, where they will provide the electrical link between the room temperature power cables and the cold bus-bars, bringing the current from/to the cryo-magnets. Among the LHC current leads, 1030 components incorporate a section with HTS (High Temperature Superconducting) material. Optimized conventional self-cooled current leads conduct into the liquid helium about 1.1 W/kA. For the LHC HTS current leads, the use of HTS material allows a reduction of heat load into the liquid helium by a factor of 10 if compared to conventional self-cooled leads. The reduction in total cooling power is about a factor of 3. Following an intensive R&D program, which started at CERN in early 1995, devoted to the test of high current HTS elements, the Bi-2223 tape with a silver-gold alloy matrix has been selected as the most suitable material for the LHC current lead application. The HTS current leads for the LHC machine represent the first application of HTS material in a large scale accelerator system. The HTS current leads are used for circuits operating at ultimate currents comprised in the range 600 A to13000 A. They are designed as three different types optimized for operating respectively at 600 A, 6000 A and 13000 A. They power the LHC main dipole and quadrupole magnets, the dipole and quadrupole magnets in the matching sections and dispersion suppressors and some of the corrector magnets. 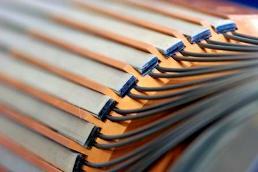 The remaining leads, which are resistive, feed the 60 A and 120 A electrical circuits of the corrector magnets. They are 2024 in total and they are designed as three different series: a series of 60 A and 120 A conduction-cooled leads and a series of 120 A gas-cooled leads. In spite of their important number, these resistive leads transport only about 5 % of the total current powering the LHC magnet circuits. They are of a special design which was developed to satisfy the LHC requirements of flexibility and compactness while having good electrical and thermal performance. The design of all these LHC leads was made and validated at CERN with the construction and test of prototype units. Key-issues of the design are the optimization of the thermal and electrical performance, the compactness and sturdiness of the components, which are conceived to guarantee continuous operation of the magnet systems during the LHC lifetime. The final series are being manufactured in industry and external laboratories on the basis of CERN “build-to-print” designs. Specification and procurement of the electrical ancillaries for the current leads to be installed and operated in the LHC tunnel.